Strawberry picking was a frequent activity in my childhood although collecting blackberries from the “wild” is a new experience. Walthamstow, an urban sprawl in East London, sits between a surprising amount of green space courtesy of the Lea Valley and Epping Forest. Criss crossing under the various railway lines that streak through Lea Valley’s Walthamstow Marshes we saw bucketfuls of blackberries desperate to be picked. Late for a birthday party, we returned armed with containers a week later to gather luscious black fruit. It was well worth the second trip however I will wear long sleeves and trousers next blackberry season. Prickled and scratched back in the kitchen I decided to make a gluten free blackberry tart from Snog Healthy Treats Cookbook. Instead of pastry it features a spicy crust made from almonds and allspice. Have you foraged for anything this summer? I am sending this blackberry pie to Ren at Fabulicious Food for this month’s Simple and in Season. To make the pie crust, put the almonds, salt and allspice in the bowl of a food processor. Process until finely ground and loose. Add the raisins, agave nectar, vanilla and 1 tbsp cold water and process until the mixture begins to stick together to form coarse crumbs. Put the mixture in the dish/pie plate and distribute along the bottom and the sides to form and even layer. Press to compact with your hands, shaping the crust flush with the rim. (The pie crust should be about 8mm / 3/8in thick.) Chill in the refrigerator for 20 minutes. To make the filling, put 250g / 2 cups of the blackberries, the dates, agave nectar and lemon juice in the bowl of a food processor and process until smooth. Transfer to a large bowl and stir in the remaining blackberries. Pour the filling into the pie crust and distribute evenly with a spatula. Refrigerate for two hours then cut into slices and serve chilled with Greek yogurt on the side, if liked. Stored in airtight container, this pie will keep for 4 days. Blackberries are growing in the woods behind our house and this looks a perfect, healthy treat to make with them. As a cancer nutritionist and healthy food blogger it is always good to get other’s take on seasonal ingredient,s and I love non-bake/nut-based crusts. Great whether or not you are g-f! I have loads of black berries at home…what a lovely dessert to make. Thanks for the great recipe:) You have a great blog. 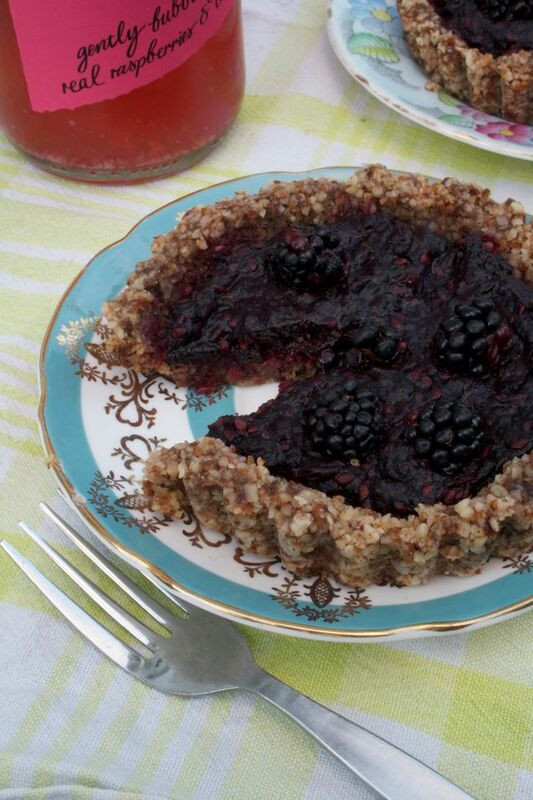 These look lovely – a more wholesome, nuttier version of a jam tart! 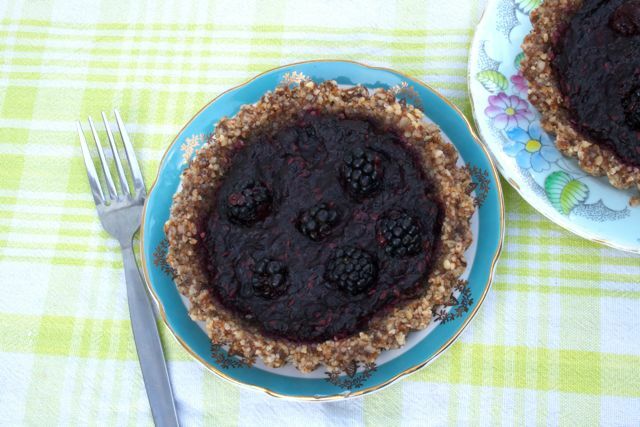 And a great way to use up all those delicious ripe blackberries. A really lovely seasonal treat! Thank you so much for linking up. 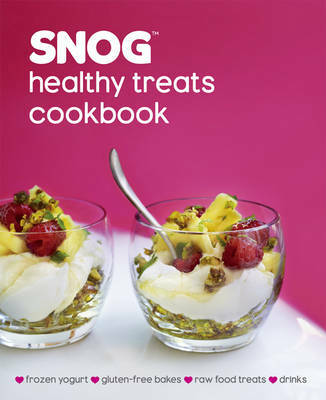 Love the sound of the SNOG book and it will be nice to try this recipe from it.